Can Kelly Conquer the White House Chaos? The new chief of staff has the confidence of a general and the power of the last available grown-up. I realized as I wrote this that I’ve never met a Kelly I didn’t like, who wasn’t admirable. There was the great journalist Michael Kelly, lost in Iraq in 2003 and mourned still by anyone with a brain: What would he be making of everything now? There’s Gentleman Jim Kelly, formerly of Time and an award-winning journalist. Ray Kelly was one of New York’s finest police commissioners. Megyn Kelly is a brave, nice woman. I wrote once of a small miracle in which a group of friends arrived, late and in tears, to see John Paul II celebrate Mass in New York. The doors of the cathedral were shut tight. A man in a suit saw our tears, walked over, picked up a sawhorse, and waved us through. As we ran up the steps to St. Patrick’s, I turned. “What is your name?” I cried. “Detective Kelly!” he called, and disappeared into the crowd. Grace Kelly was occasionally brilliant and always beautiful. Gene Kelly was a genius. There is the unfortunate matter of the 1930s gangster “Machine Gun Kelly,” but he is more than made up for by Thomas Gunning Kelley (an extra e, but same tribe), who in 1969 led a U.S. Navy mission to save a company of Army infantrymen trapped on the banks of a canal in South Vietnam’s Kien Hoa province. He deliberately drew fire to protect others, was badly wounded, waved off treatment, saved the day. He received the Medal of Honor. There are other Kellys on its long, illustrious rolls. 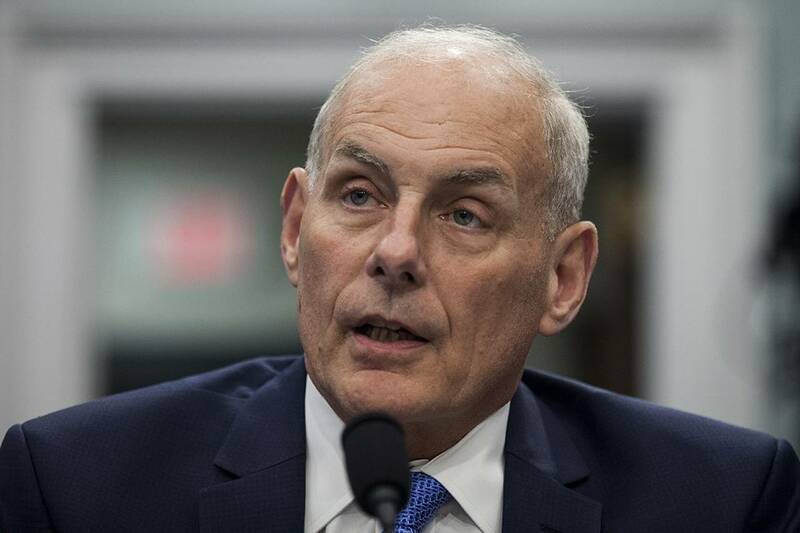 So Gen. John Kelly (retired), U.S. Marine Corps, veteran of Anbar province, Iraq, and new chief of staff to President Trump: onward in your Kellyness. Everyone wonders what he’ll do, what difference he’ll make. He is expected to impose order and discipline, tamp down the chaos. I suspect his deepest impact may be on policy and how it’s pursued, especially in the area of bipartisan outreach. It’s true. And in a nation that loves to categorize people by profession, they can be surprising. Generals and admirals are rarely conservative in standard or predictable ways, ways in which the term is normally understood. They’ve been painted as right-wing in books and movies for so long that some of that reputation still clings to them, but it’s wrong. They are not, or not necessarily, economic conservatives. Top brass are men and women who were largely educated in, and came up in, a system that is wholly taxpayer-funded. Their primary focus is that the military have what it needs to do the job. Whatever tax rates do that, do that. They are not economists, they don’t focus on Keynesian theory and supply-side thought. They’re like Gen. Dwight Eisenhower, who saw the historically high tax rates of the Roosevelt-Truman era and thought fine, that’s how we won World War II. He didn’t seem concerned about tax rates until he’d been president for a while and started hearing about the problems of business while playing golf with CEOs. In my observation generals are both the last to want to go in (“Do you understand the implications of invasion? Do you even know the facts on the ground?”) and the last to want to leave (“After all this blood and sacrifice, this hard-won progress, you’re pulling out because you made a promise in a speech?”). They hate hotheaded, full-of-themselves civilians who run around insisting on action. Those civilians are not the ones who’ll do the fighting, and as public allies they’re not reliable. When things are working right, chiefs of staff have an impact on presidential thinking. They guide discussions toward certain, sometimes directed conclusions. They’re expected to give advice, and it’s expected to be grounded in knowledge and experience. It may be easier for Mr. Kelly to impose order than people think. Sacking Anthony Scaramucci sent a message. The warring staffers around Mr. Kelly know it won’t be good for them if they don’t support him, at least for now. If they fight him with leaks, they’re revealed as part of the problem of the past six months. If they are compliant and congenial, it will look like they weren’t the problem; someone else was. Also they’re tired of being part of a White House that has been famously dysfunctional. It will help their standing in the world to be part of something that works. Similarly with Mr. Trump: If it works with Mr. Kelly, the first six months were Reince Priebus’s fault, if it doesn’t work, it was the president’s. Beyond that, a good guess is that Mr. Kelly will not be especially interested in partisan differences; he will not be ideological. He will guide Trump in the direction of: Solve the problem. Generals are not known for a lack of self-confidence. If he goes up against Mitch McConnell it won’t be big dawg versus eager puppy, it will be big dawg versus big dawg. And Mr. McConnell has already disappointed the president. Mr. Kelly hasn’t. Mr. Trump, whatever his public statements, doesn’t need to be told things haven’t gone well; he knows. He has nowhere else to go, and the clock’s ticking. Mr. Kelly has the power of the last available grown-up. Another advantage: He doesn’t need the job. He’s trying to help, as a patriot would. But this is not the pinnacle for him. His whole career has been pinnacles.